Jerome Harris is a graphic designer originally from New Haven, Connecticut. He holds an MFA in graphic design from Yale University, and a BA in Advertising from Temple University. During his graduate studies he was a teacher's assistant for Pamela Hovland's Intermediate Graphic Design course for undergraduate students. Since graduating last Spring, he was an active designer in the greater New Haven area, working for Yale, with local arts nonprofit Artspace, as well as multiple small businesses and organizations in the area. He designed the identity for the Black Pulp! Exhibition, which examines evolving perspectives of Black identity in American culture and history from 1912 to 2016, curated by William Villalongo and Mark Gibson. 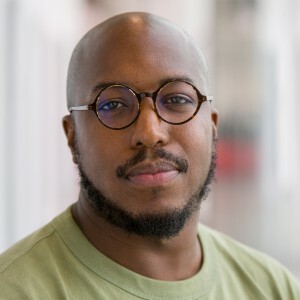 Jerome was also a guest critic for the Emerging Professionals Workshop held by the AIGA Connecticut Chapter, reviewing graduate and undergraduate graphic design students' portfolios. Outside of design Jerome is a dance teacher, gamer, home cook, and aspiring DJ.